Northwest National Real Estate: New Listing! Fabulous Fixer Upper! New Listing! Fabulous Fixer Upper! 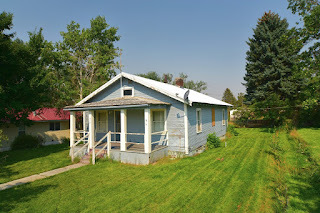 This charming home in a very nice, secluded and quiet location is for sale located in Arco, Idaho. The property has a large, developed and well maintained yard. The house sits on a double lot with mature trees and underground sprinklers. There is also a 1200 square foot 2 car garage that includes a shop! The basement is unfinished but full of room and plenty of potential. Also, included is a wood burner in the family room with oil forced air furnace. Needs some TLC but this home is a great investment at this price. Contact L.P. Barnes Real Estate for further information at (208) 527-3307. Priced at $53,000.